Hey everyone – hope you’re having a lovely thursday! Actually, you can go a bit wild as well with the lines and stanzas – just use the vocabulary of the profession you have chosen..
Just stopping in to say hi. Hope everyone is having a good day! hey mary.. will email you ina bit…. I feel better now having read more carefully the prompt. I feared that I had dove off the deep end, falling out of the prompt tree, breaking rules as I plunged into expansive poetics, but perhaps not. It’s like what Bjorn postulated in his poem today, the “cleaning crew” always has a chore making sense, or an invoice out of poetry. I am just joyful after each prompt that the flood gates of creativity spring open, & a poem never fails to emerge; & for me, “the poem is the thing”. It is helpful, as a learning experience to “follow the rules”, as a learning experience, but when a poem finds its own way to paper, when it springs on you out of the shadows of a Muse, I just embrace it. In addition, tonight we all need to take advantage of Claudia’s new found expertise in Mixology, try something different, dangerous, daring; like a Singapore Sling or something with peanut butter in it. Ha, I like the mojito too! A good mojito is so refreshing, but I consider it more of a summer drink. Really a cool photo, Claudia! You look like an expert there. a while back, there was a request to submit images for a new header for dVerse. I propose that the picture you just posted here, Claudia, would make an excellent pic…it has the pub theme going, and one of the actual dVerse pubtenders in the pic too! Hello, I’m on my way home – tonight a concert with music of Dvorak and Rachmaninov- wonderful. How fun to be a bartender for real.. Can I have a Mojito Claudia? sounds like a wonderful concert! Rachmaninoff’s third piano-concert is a real challenge for the piano-solist. I used to play piano…pretty much anything by Rachmaninoff would give me nightmares to try to play. Sounds like a great concert! haha – not at all… want a drink? one of the interesting things about this prompt is that so many nouns can also be used as verbs (or vice versa). In fact, more than a few of my verbs ended up as nouns in the poem. Oh, that sounds good! I wouldn’t mind having one of those either! It was meant to be, cause Thursday was my one free day in WP world. I was looking for a place to share my poetry and this is such a great place. Rest assured — here we do challenges to stretch ourselves as poets. 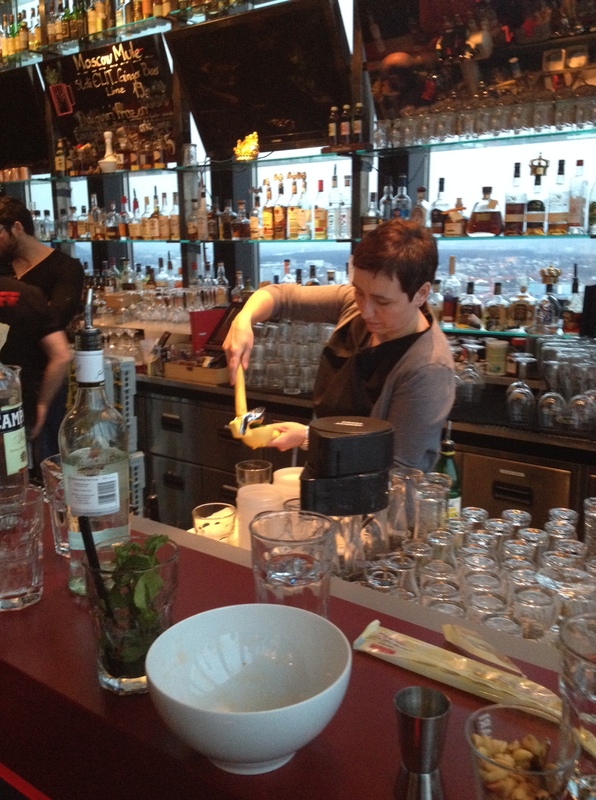 Yes, she definitely looks like a good mixologist! yes she does… smiles. Pour it up C.
Thanks for the challenge, Claudia. Cool shot of you behind the bar. I may not have gotten the rules quite right with this challenge, but I had fun trying…smiles. I have only the vaguest idea what happened to the prompt. But my grandfather really was a longshoreman, if that helps. Oh Claudia, forgot to stop by the pub. So rude. I enjoyed all the poems here. What a great prompt – everyone wrote such great pieces that gave us insights into their lives. Loved it!